"I began this law firm years ago with the goal of helping real people, like you and me, who felt disenfranchised by the horrific insurance system we have in Ontario. When I began practicing law, I noticed very quickly that the cards were stacked against innocent accident victims and their families, in favour of large, deep pocketed insurance companies. That didn't sit right with me, and it still doesn't. Every day, our office strives to make a profound, meaningful change in the lives of our clients and their families. When the cards are stacked against you, I hope you look to our office to bring that same meaningful change to your life." Brian dedicates his practice exclusively on behalf of accident victims, disability claimants, and their families. He is a plaintiff personal injury lawyer, through and through. He doesn't accept work on behalf of insurance companies. He has been championing the rights of the little guy since he was called to the Bar of the Law Society of Upper Canada in 2004. He has won millions and millions of dollars on behalf of his clients both inside, and outside of the courtroom. Brian has appeared before the Ontario Court of Appeal, Ontario Superior Court of Justice, Federal Court, Financial Services Commission of Ontario, and Canada Pension Plan Review Tribunal where he has won various cases for his clients. In the media, Brian has been interviewed by national and provincial news sources including CBC News, the Globe & Mail, the National Post, the Toronto Star, Lawyers' Weekly, Law Times, CityTV and CP24 for his knowledge in the field of personal injury law. He also hosted his own radio show, "A Legal Matter", on CHRW 94.9 in London. Brian has been ranked in the 2017 Lexpert Canadian Legal Directory as a "Leading Lawyer to Watch" in the area of Personal Injury Law on behalf of Plaintiffs. Brian, along with his team of 2 other lawyers and 3 law clerks practice in all areas of personal injury law including but not limited to traumatic brain injury, spinal cord injury, paraplegia, quadriplegia, neo-natal cases, broken limbs, serious car accidents, bicycle/motorcycle accidents, pedestrian collision cases, boating accidents, slip and falls, dog bites, chronic pain and long term disability claims. 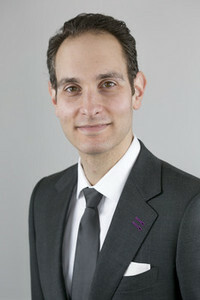 Brian earned his Bachelor of Arts from York University in 2000 where he graduated on the Dean's List and earned his Juris Doctor from the University of Windsor in 2003. In the community, Brian is a past Director of the New Leaders of Sunnybrook Foundation and an active member of the Ontario Trial Lawyers' Association. Goldfinger Law’s team of law clerks, legal assistants and clerical support staff share the same drive and determination which guide our law firm. Our support team make sure that every call, every email and every question is answered by a lawyer within 24 hours. You will never feel left in the dark. You will never feel alone. We will be there for you in one way or another. 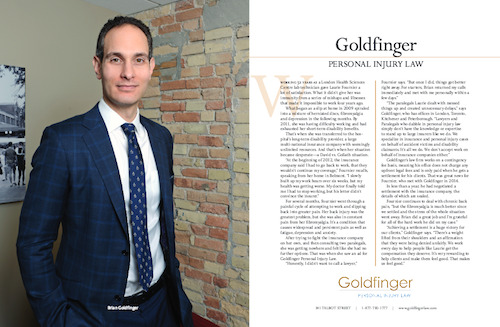 In addition to our team of law clerks, legal assistants, and clerical support staff; Goldfinger Law has a network of nurses, physiotherapists, occupational therapists, speech language pathologists, chiropractors, registered massage therapists, rehab coaches, vocational counselors, psychologists and social workers we consult with to better help you with your case. We have assembled our network from across Ontario. We carefully screen all of our medical specialists to make sure they will work best with you and get you the best results for rehabilitation, and for your case. We take this pairing very seriously and so should you. Seeing the wrong medical specialist may be detrimental to your health, and may jeopardize your case. Just like our creed not to represent large insurance companies, our team of medical specialists don’t act for insurance companies either. They take the same pride in helping the little guy as we do. Our medical specialists take great satisfaction in seeing you get better. Even after your personal injury case is closed, it’s not unusual for them to check up on you to see that you’re doing well. We work with good people, because good people render good results both for you, and for your case.